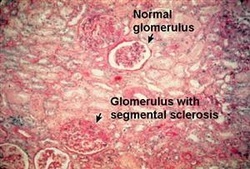 Focal segmental glomerulosclerosis may present with nephrotic syndrome. Nephrotic syndrome may include proteinuria, hyperlipidemia, edema and hypoalbuminemia. Patient may also present with microscopic hematuria.There is a high percentage that the patient may progress into end stages renal failure. Focal segmental glomerulosclerosis may present with IgM and C3 deposition. There will be fusion of the epithelial foot processes. Focal segmental glomerulosclerosis is associated with deposition of the hyaline masses ( hyalinosis). There will be sclerotic lesion with segmental distribution which only involves part of the glomerulus or focal distribution with involvement of some of the glomeruli within the capillary tuft of the deep juxtaglomerular glomeruli. Focal segmental glomerulosclerosis is common with HIV patient, IV drug user, HIV infection, heroin use and obese individuals. The treatment may include the intake of prednisolone. 1.D'Agati, Vivette D., Frederick J. Kaskel, and Ronald J. Falk. "Focal segmental glomerulosclerosis." New England Journal of Medicine 365.25 (2011): 2398-2411. 2.Goldszer, Robert C., Joan Sweet, and Ramzi S. Cotran. "Focal segmental glomerulosclerosis." Annual review of medicine 35.1 (1984): 429-449.